Life in fifty years will be a lot different then it is now. In most peoples eyes they see the world having flying cars and floating houses but I believe the world will be more eco-friendly and organic. Lives will be saved, let it be humans or even animals. With new living styles, resolving health issues, and coming to world peace it can lead to happier and longer life spans for most individuals. By 2061 technology will have greatly improved such as holograms and robots. Government will be apart of every moment of our lives from the time we are born until the time we pass. Freedom will be scarce because the government will have control over every move we make. Everyone will work for the government and no job will benefit one-self. Our government will be ran as if we had “a mother” watching over us. Our leader of this type of government will be a female president, who represents control and power. You see these type of example in today society when the majority of women run an organization. With a rise in population the environment was in need of a solution for housing. Everyone begins to leaves the cities and moves to the forests or other spots in nature. The homes will consist of constructed tree houses. They will be solid glass on the outside—you can see out, but others cannot see in—and they will be very high tech. There will be no reason to cut down trees or corrupt animal habitats. Children will start school around the ages of 2 to 3 years old. Teachers will not be teaching because they will be learning on a online website. Computers are the only resource that anyone will be using. If there is any need of assistant teachers will appear as a hologram. The students will get their assignments through e- mail and kids will go to school 7 days a week—expect for holidays that the government allows. Ah, 50 years ... So it's time (to quote an unmentionable colleague) to take situation of the stock ... Freedom and Partition, the good with the bad, the wonderful with the traumatic, both in the same event, no wonder we are schizophrenic. Amidst one's daily clutter, one doesn't usually reflect on the splendour of being free because - naturally - one has to get on with the business of living. One has children who've to be driven to school because they've missed the school bus; one has to try and bathe and fill up enough buckets of water for the day before the municipal taps run dry at 8.00 a.m.; one's first meeting of the morning started 10 minutes ago and one is still 15 km away from it; one has to dress for a fancy dinner and one is both tense and depressed to discover that one's only decent suit looks much less deadly than it did last year; one could thus accumulate a dozen instances of the minutiae of one's life. In these circumstances, one usually doesn't stop dead in one's tracks, slap one's forehead and exclaim, "My word! We are free! We've been free for 50 years, but don't take it for granted! Rejoice! Things could be worse! Partition could recur! Because the enemy's now within! Rejoice that we haven't yet cracked up!" Aha, but there isn't anything to rejoice about, is there? Apart from the 50 reasons for gloom that one can come up with, off the cuff, one also notes that one's parents, who witnessed 1947, aren't rejoicing either (they haven't, ever, but that's another story). For them, Partition was the Ultimate Bad Trip; it's almost as though Freedom isn't worth it if one has to pay for it with all that insanity, that savage blood. Almost not worth it. In these 50 years, the question whether we ourselves are worthy of the Ultimate High has, I'm sure, recurred to many of us, and with increasing doubt. The enemy within. My first moments of reckoning were the riots of 1984. Taxicabs burning with Sikhs inside them. Be proud to say that you are an Indian. I told myself that I'd prefer to think of myself as a dislocated Bengali. Nothing like watching some of your fellow countrymen burn other fellow countrymen to make you want to dissociate yourself from all your countrymen. Thank God (but where the hell was He?) that her bloody assassins hadn't been called Dey or Dasgupta or Sen. Could these sons of the soil of this ancient, tolerant, mystically-one land, these frenzied, red-eyed men in white, could they differentiate, for example, between Chatterjee and Sen? When they attacked, would they, or would they not, leave the Bengali Brahmins alone - that was the question. How come, did you ask, that you experienced your first moments of reckoning only when you were 25, in 1984? Didn't the Emergency, for example, wake you up? Pardon me, but are you retarded, by any chance? Well, yes, sort of, up to a point ... You see, when the Emergency was declared, I was a Babe in the Woods. I'd discovered how to inhale while smoking and one's horizons had dramatically expanded. In Hindi class at school, our politically aware teacher had made us write essays on The Importance Of The State Of Emergency (Aapatkaaleen sthiti ka mahatva). We'd all justified it; all our essays began with "The dark clouds of war were hovering in the sky (Aakash mein yudh ke kaale badal mandra rahe the)," and wandered on, in execrable Hindi, to "The need to protect the country (Desh ko surakshit rakhne ke liye)." From the ISI Mark, one would've added, had one been less of a Babe. At 16, in contrast, in other parts of the world, in Afghanistan, Bosnia and Vietnam, the young are shooting away, from the hip and from the shoulder. Not necessarily better, of course, and certainly a lot less peaceful, but why is it that the Indian middle-classes are so hopelessly ill-prepared to take on the world? What on earth does their education prepare them for? Oh, how woeful mine turned out to be when it came to facing my own country! At the age of 25, we, in tears, leave our mothers' laps only when the jobs we've avoided for years at last force us to get up and move - perhaps, horror of horrors, to another town - which is where we buy a two-wheeler, try to make tea in the mornings, and break down. Fifty years, taking situation of the education stock ... to the young girls of Mumbai who haven't bathed since Michael Jackson flicked his sweat at them in the Andheri Stadium last year, one would suggest a few courses in the history and unity of our nation. Its fundamental mystical oneness, of course, will not be in doubt to anyone who has seen the shining, the effulgent light in the eyes of the citizenry - Hindu, Muslim, Sikh, Christian (and Nav-Buddha, one should add, mindful of time and place) - that flocks by the hundreds to participate in the TV Super Hit Hindi Film Song Antakshari Programme. One, it fundamentally and mystically is ... but what makes it tick, the unwashed girls would want to know, what's its trip like? Caste. A course in caste is essential. Caste is what distinguishes Chatterjee from Sen. Caste, as Baron de Bougainville said, predates Vishnu and will survive the Apocalypse. It will decide, till you die, and for the next 400 generations, what you eat, what you wear, where you sleep, how you piss, who you marry, what you study, what you work at and how you'll be disposed of when you die. It is eternal, living history. It has been officially institutionalised. It is what makes the country move. It's either in front of or behind almost every political decision that we take. If you aren't affected by it, if you think that it's only a subject for the sociologist, why, then you aren't one of us. It also causes one hell of a lot of violence. On which the Andheri girls would be advised to take a second course. In the doublespeak that comes naturally to us, we continually try to convince ourselves of our peace-loving traditions and our non-violent ideals. The Buddha, doublesay we, forgetting that his teachings withered on our soil, a hostile environment, doubtless; and Emperor Ashok (Shok-a, to me he'll always be, because of the deadly Punjabi accent of my Standard VI history teacher); and Mahatma Gandhi - a bit like the Trinity, or the Lion Capital. Once, for an exhibition on non-violence that was to be sent to a couple of places in the Far East, we tried to slip in Pandit Nehru, quite sure that nobody'd either notice or care. But it didn't work. We could, instead, with profit exhibit, for starters, the evidence of 1984 or 1993, or of any month of any of the last 50 years. With our history of communal and caste conflagrations, however, can we pretend to be more peace loving, more tolerant as a nation, as a people, than the others in the world? It boggles the mind. Nineteen-eighty four showed me how truly horrible we were. Apropos of Indianness, a stray memory of the Emergency ... On the sides of DTC buses those days was often painted the slogan Be Indian, Buy Indian ... An encouragement to thrift, no doubt ... Wherever he could, a friend of mine, a thinker, bearded, JNU of course, now shaved and balding and a formidable deputy commissioner of police in Orissa, would scratch after the second "Indian" the word, "dope". It made sense. Sound economics too. Ah well, back to the rambling ... 1984, 1989 ... more violence, more horrible deaths ... poor Rajiv Gandhi was young, one wished him well ... you know, what one needs at the helm of affairs are the same old virtues - stability and vision, a Nehruvian combination ... in 1950, the PM could plan ahead to 1965 (make that 1964) because he knew that he'd be around ... Bhilai, Rourkela, the IITs, Bhakra Nangal ... but with our generation, time itself has sped up, hasn't it? ... Even government - slow, ponderous, complex, knotted, unwieldy government - now is compelled to act and react faster, it's the Zeitgeist. Though the acceleration in tempo doesn't change the essential question, the insurmountable problem, it simply makes it more acute. The question itself is at least as old as Plato - namely, how does one get the good men, the best men, in any system to administer the country? Wouldn't the BYT just love the absence of discernible objectives, the mazes of Triplespeak, the enormous chasms between goal and direction? Armed with all the newest How-To ideas, wouldn't they set themselves, in the next 50 years, the new objective of de-governmenting the nation? Give up, they would advise it, where it doesn't work. "Wouldn't the BYTs just love the absence of discernible objectives?" It has its virtues, though. As one of the world's largest corporations, government, the microcosm, is uniting. One can see more genuine UID (officialese, unity in diversity) in the rooms of Shastri Bhavan during lunch hour than on Rajpath in the forced gaiety of the folk dances of the Republic Day parade. Idlis mingling with chhole, appams and sarson da saag, alu parathas with sambhar. Ditto for the tongues that one will hear. Stray Hindi phrases in a Tamil accent ... there wouldn't be any language barriers in India if one followed certain ground rules ... for example, the simple principle that the language of the people should be the language of governance. Nothing alienates like a familiar face rendering a familiar tongue alien ... whether it be Hindi or English, Bengali or Marathi, keep it simple, play it straight. You aren't saying anything that you haven't said before. Why don't you speak so that I can follow? What're you trying to hide? To end with the pits, the ultimate vulgarity - I quote myself: An Indian is one who is born one and doesn't wish to change his citizenship. It should be a valid enough definition to instil in us a lasting sense of identity, to provide for the future a sort of harmony - even better that it's low-key. A vast country, a varied people, a geography fashioned to cushion one region from the anxieties of another - we were designed to be a confederation - a bit like the one for Indian Industry, but more cool, and much less suited-booted. 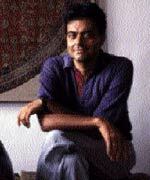 Author of three books, Upamanyu Chatterjee, a bureaucract, is best known for English, August, his first novel.